Hematohidrosis or also called hematidrosis is a very rare condition, in which a person may be sweating blood. Although impressed, hematohidrosis unproven harm the soul. Hematohidrosis sufferers will produce blood; sweat or blood appears from the pores of his skin, but not being injured. Cases like this are very rare, and the causes of the emergence of this complaint are also still unknown. One of the cases once reported hematohidrosis occurred to a girl in India. A series of medical checks are performed to detect this disorder. However, no abnormalities were found in the child's body. He also had no history of surgery, no family history of hematohydrosis, and had a normal menstrual cycle. Not much information is known about hematohidrosis because of the rarity of the disease. Presumably, hematohydrosis is caused by bleeding in capillary blood vessels that drain blood to the sweat glands. Capillaries are small blood vessels located in the tissues of the body. Its function is to bring essential nutrients throughout the body. Usually, the body produces chemicals such as cortisol and adrenaline, to prepare the body for threats. The secretions of cortisol and adrenaline make the body more energetic and alert. However, reactions in people with self-defense hematohydrosis trigger capillary rupture. As a result, blood exits through the sweat glands from broken blood vessels. This possibility can be triggered by high blood pressure, severe stress, emotional distress, or extreme fatigue. In addition, there are other factors which are thought to cause hematohidrosis. The first is the appearance of the menstrual blood is not from the womb. The second, i.e. the psychogenic purpura, a condition in which bleeding occurs suddenly without any cuts or bruises. But all these allegations still need further research. 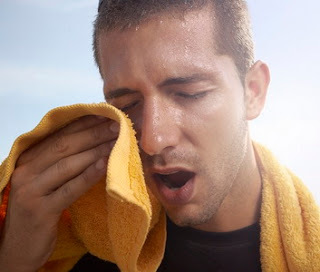 The most obvious symptom is hematohidrosis out sweat blood in the form of skin pores. This condition can occur in any part of the body, but most commonly occur on the face. The blood can also come out of the mucous layer, as from the mouth and nose. The skin around the area that is bleeding may experience temporary swelling. Patients can also be dehydrated. Although impressed, has not been proven dangerous hematohidrosis. The blood that comes out will stop by itself. Hematohidrosis sufferers may need to perform a series of such examination a physical examination and complementary form of liver function tests, kidney, urine, endoscopy, and ULTRASOUND. If it turns out that the test results did not show the presence of abnormalities and patients are indeed feeling stressed, it's likely the doctor will suggest therapy to control the stress so hematohidrosis does not appear. 1. Antidepressant Medication to relieve depression. 2. Medicines to help blood clotting. 3. Medications to lower high blood pressure. Hematohidrosis indeed does not harm the soul. But the blood out of the skin's surface must be very intrusive and affect the appearance. If there are complaints in the form of bloody sweat, you are advised to consult a doctor to get a Checkup and treatment further.